This is the Panhandle bike path marking for the upcoming Shrader Valve. 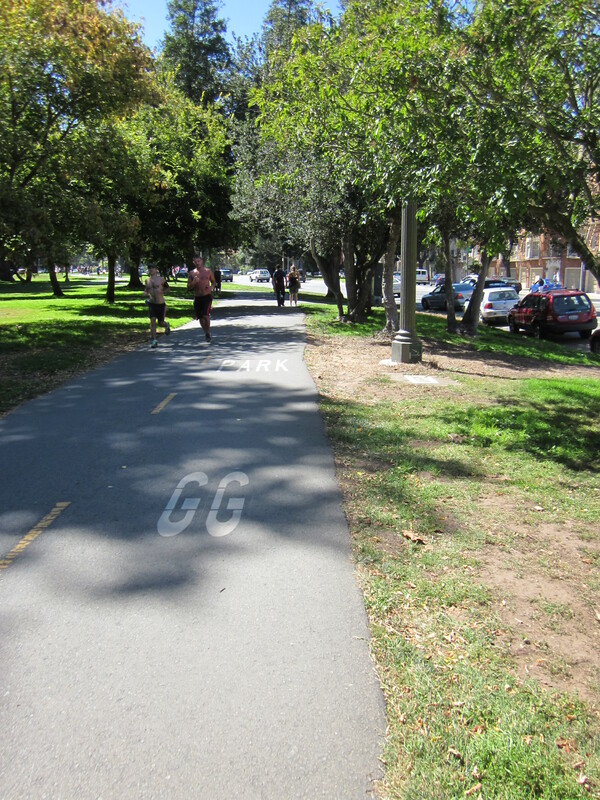 The connection from the Panhandle to Golden Gate Park is a bit complicated. Before the western edge of the Panhandle, bikes veer off the path to the right at Shrader Street. The bike light at Shrader Street directs you into a marked bike lane on Fell Street, which in turn leads to the protected bike lanes of Golden Gate Park. The turn is called the Shrader Valve. Starting from Market Street at the Ferry Building, through the Wiggle to the Panhandle, and through the Shrader Valve to Golden Gate Park, you can ride a bike in marked lanes on a relatively flat route from San Francisco Bay at the eastern edge of the city to Ocean Beach at the western edge, and back again. Bike light is green! Follow the arrow into the Fell Street bike lane, and it’s a straight shot from there to the ocean. I finally got a picture of the Shrader Valve intersection this afternoon on the way home from Western Addition Sunday Streets. It’s not just for tires anymore! That’s a cute name for this little connection, but I have to say I have never used it! I (and lots of others) prolong the pleasure of riding out of traffic til I get to the pointy tip of the panhandle, then cross Fell in the crosswalk to join the GG Park bike lane. Maybe I should give the Shrader valve a spin, though. Do you prefer it? 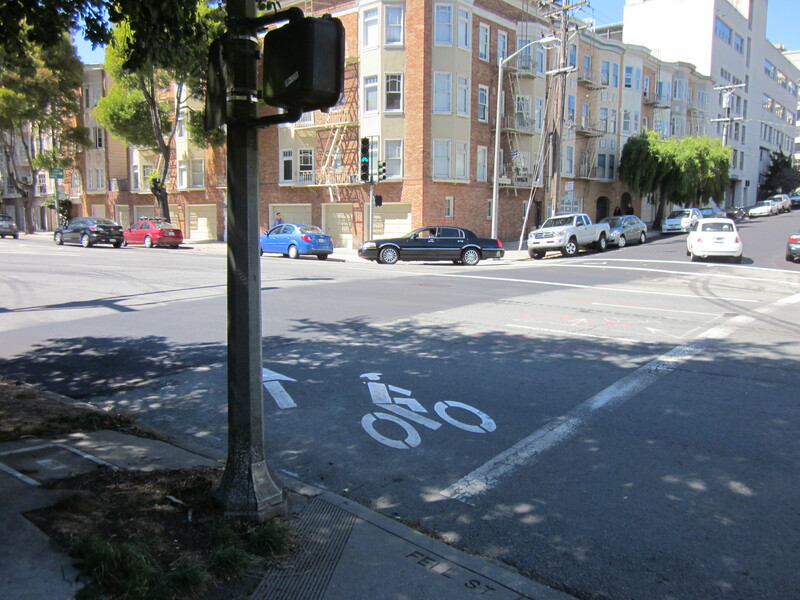 I prefer the Shrader Valve despite having to ride with car traffic for a block because I don’t have to walk the bike across the awful Stanyan-Fell intersection and because the lights are timed, so there’s no stopping between the Shrader Street turn-off and the entrance to the park. The Fell Street bike lane isn’t the greatest but drivers have always been very respectful–they can’t buzz bikes even if they want to, because they’re starting from a full stop and they’re a short block from another red light–and no one ever tries to park in it. However I’ve noticed it’s about a 50-50 split between riders who take the valve and those who ride to the end of the Panhandle, so I don’t think there’s a generally preferred route. Regardless the name makes me laugh.